At present, Berg's compelling masterpiece is very well served on the DVD medium; there are no less than three versions available; but this 1994 staging is undoubtedly the best of the crop. Patrice Chereau's vision of keeping things simple yet starkly dark, works wonders for this psychological drama of jealousy, infidelity and murder, and his exploration of the characters' tormented souls is wholly successful and shocking. Aided by some brilliant acting (and singing) and some superb close up shots, Chereau squeezes all the anguish and violence out of Buchner's dramatic conception. His knack to keep a fine balance between pity and revulsion is indeed sharp and vivid. The protagonists are all deeply immersed in their efforts to bring out all that is humanly possible from this disturbing mixture of events, but Grundheber's "Wozzeck" must surely stand out as his best ever portrayal of the part, surpassing even his outstanding Vienna performance (on Arthaus). Barenboim proves himself to be a masterly conductor bringing great sensitivity and attention to detail to this notoriously difficult score. 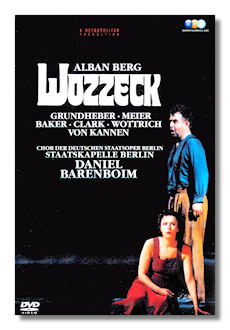 Sound and visuals are first class and I have to say that this is definitely now the "Wozzeck" to have on DVD.